People are eager to extol the benefits of fresh green vegetables, education, marriage, and a walk in the countryside, but are instinctively suspicious of new technologies. That’s the tagline selected by the editors for the cover story I wrote for Interactions Magazine published this month. 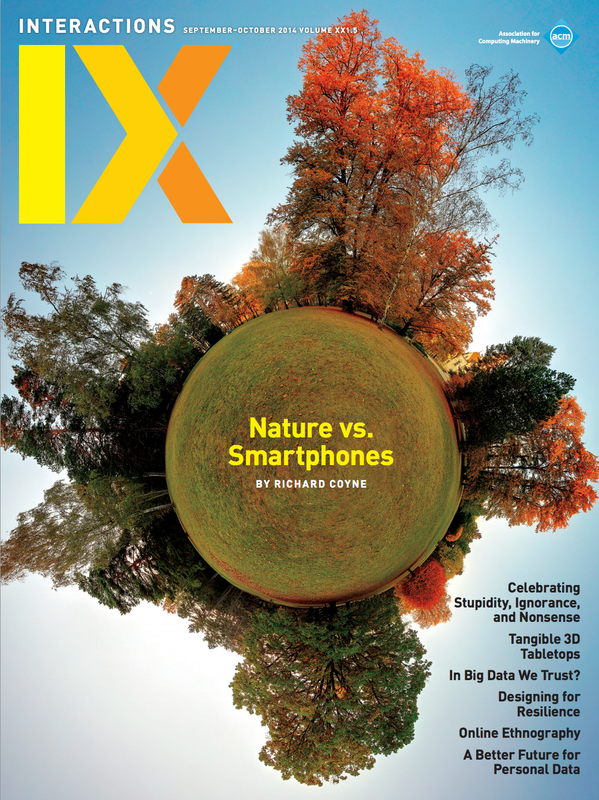 Interactions is a bimonthly publication of the ACM, and sees itself as a mirror on the human-computer interaction (HCI) and interaction design communities. It’s edited by Ron Wakkary and Erik Stolterman. That’s a quote from the pioneering landscape architect Frederick Law Olmsted. It’s good to get outdoors from time to time and enjoy nature, whether in the garden, a park, the rural countryside, or the wilderness. Art, literature, design, and common sense attest to this. The Arts and Crafts movement and 20th-century Bauhaus modernism affirmed the place of natural materials and natural forms in good design. But the claims for nature run even deeper: Nature restores and revives. To encounter natural environments is to be relieved of the stresses of modern living. I go on to explore some of the evidence for the restorative effects of natural environments, and how some people think that digital devices negate the benefits of being in nature. I argue that smartphones and other technologies present to us as “other” than nature, and that’s one of their main benefits. I make reference to the wealth of cultural affirmations supporting people’s affinity with gardens. The editors highlight the statement: “There must be some occasions when reflecting on our technology dependence prompts an enhanced awareness of life offline.” That’s a theme I’ve developed in several blog posts. The article is now available online. Coyne , R. (2014). 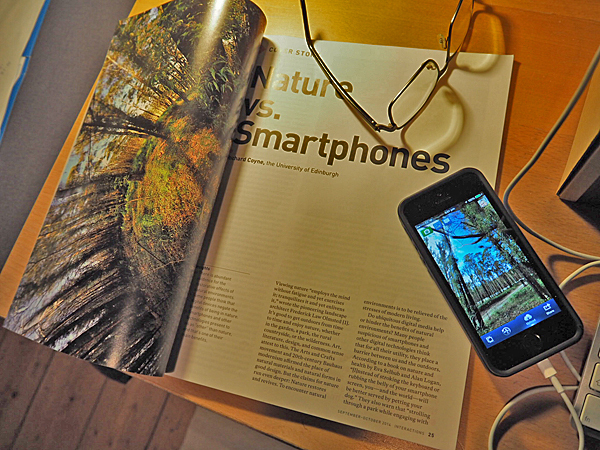 “Nature versus smarphones.” Interactions Magazine 21(5): pp. 24-31. Online. 1. Nicholson, C.J. Elegance and grass roots: The neglected philosophy of Frederick Law Olmsted.Transactions of the Charles S. Peirce Society 40, 2 (2004), 335–348. 2. Selhub, E.M. and Logan, A.C. Your Brain on Nature: The Science of Nature’s Influence on Your Health, Happiness and Vitality. John Wiley, 2012. 3. Rosen, L.D. iDisorder: Understanding Our Obsession with Technology and Overcoming its Hold on Us. Palgrave MacMillan, 2012. 4. Wood, B., Rea, M.S., Plitnick, B. and Figueiro, M.G. Light level and duration of exposure determine the impact of self-luminous tablets on melatonin suppression. Applied Ergonomics 44, 2 (2013), 237–240. 5. Murugesan, S. Harnessing green IT: Principles and practices. IT Pro (Jan./Feb. 2008), 24–33. 6. Turkle, S. Alone Together: Why We Expect More from Technology and Less from Each Other. Basic Books, New York, 2011. 7. Commision, F. Woods for Health Strategy. Forestry Commission, Edinburgh, Scotland, 2009. 8. Ulrich, R.S., Simons, R.F., Losito, B.D., Fiorito, E., Miles, A., and Zelson, M. Stress recovery during exposure to natural and urban environments. Journal of Env. Psychology 11 (1991), 201–230. 9. Ward Thompson, C., Roe, J., Aspinall, P. Mitchell, R., Clow, A. and Miller, D. More green space is linked to less stress in deprived communities: Evidence from salivary cortisol patterns. Landscape and Urban Planning 10 (2012), 221–229. 10. Roe, J. and Aspinall, P. The restorative benefits of walking in urban and rural settings in adults with good and poor mental health. Health and Place 17 (2011), 103–113. 11. Stolterman, E. The nature of design practice and implications for interaction design research.International Journal of Design 2, 1 (2008), 55–65. 12. Kaplan, S. The restorative benefits of nature: Toward an integrative framework. Journal of Env. Psychology 15 (1995), 169–182. 13. Anderson, J. Transient convergence and relational sensibility: Beyond the modern constitution of nature. Emotion, Space and Society 2 (2009), 120–127. 14. Derrida, J. Of Grammatology. Johns Hopkins University Press, Baltimore, MD, 1976. 15. Coyne, R. Derrida for Architects. Routledge, Abingdon, 2011. 17. Crum, A.J. and Langer, E.J., Mind-set matters: Exercise and the placebo effect. Psychological Science 18 (2007), 165–171. 18. Laugier, M.-A. An Essay on Architecture. Hennessey and Ingalls, Los Angeles, 1977. 19. Muniz Jr., A.M. and O’Guinn, T.C. Brand community. Journal of Consumer Research 27 (Mar. 2001), 412–32. 20. Borgmann, A. Reality and technology. Cambridge Journal of Economics 34 (2010), 27–35. 21. Heidegger, M. The Question Concerning Technology and Other Essays. Harper and Row, New York, 1977. 22. Heidegger, M., The thing. In Poetry, Language, Thought. Harper and Row, New York, 1971, 165–186. 23. Coyne, R. The Tuning of Place: Sociable Spaces and Pervasive Digital Media. MIT Press, Cambridge, MA, 2010. 24. Juslin, P.N. and Västfjäll, D. Emotional responses to music: The need to consider underlying mechanisms. Behavioural and Brain Sciences 31 (2008), 559–621.